From the runways to fast-fashion stores, bike shorts are making a comeback. What is a bike short? 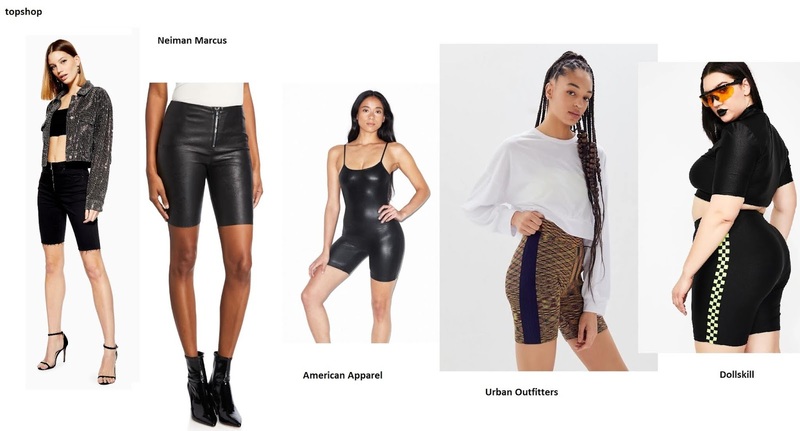 Typically it's a spandex short that hits about mid-thigh, though for the purpose of this post, I'm also going to include shorts of this length that are not just made of spandex, since for dark fashion, more common fabrics are denim and vinyl and leather. Personally, I hate short shorts, which have been popular for the last decade. I find them uncomfortable and unflattering. 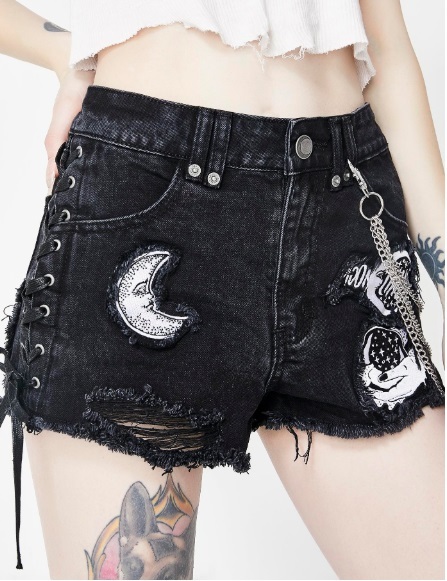 For the longest time, if you wanted your own pair of mid-thigh shorts, you'd have to make them yourself, but thankfully, longer shorts are now in style--and not just in jersey spandex. There are denim and leather versions as well so that you can stay cool this summer no matter what your body type is. Obviously, this look originates from athletic wear, so athletic goth styles are obviously a good choice. 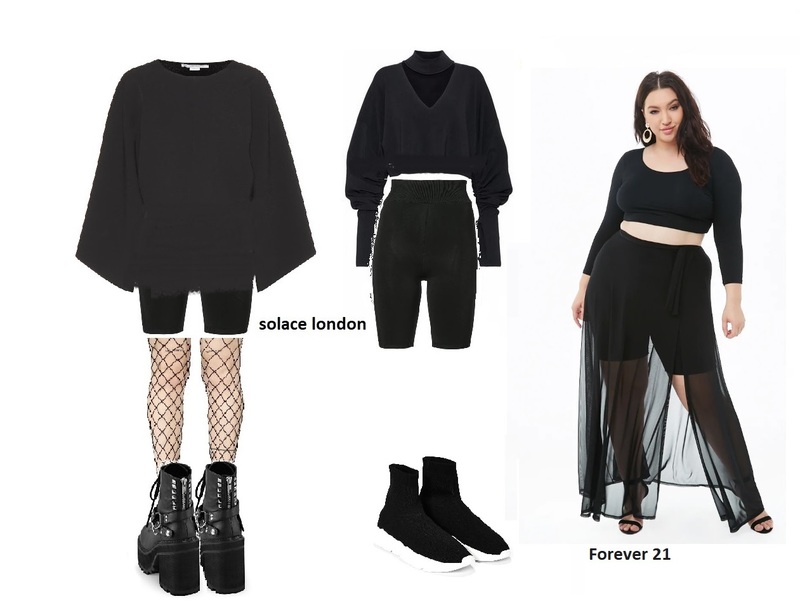 I would pair it with a sock sneaker and a baggy top that either covers or hits at the waist, depending on how much of your figure you want to show or is flattering on you. Another great way to wear it is underneath all of the sheer skirts or skirts with high slits that have been trending recently. 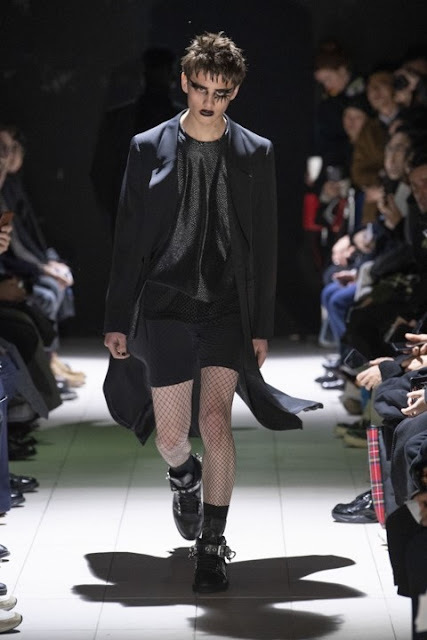 Though my favorite way to wear this trend is using the 90s industrial influences, as seen in the Comme Des Garcon men's line (as in the first photo in this post): with fishnets and big boots. Would you wear longer shorts? How would you style them? I'm more of a capri pants person.